Here the player has a cloaking item -- so does the background, apparently. So, I guess the real question is, did I have fun with the game? 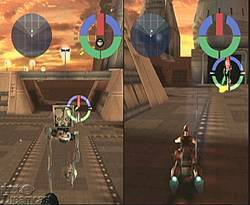 The standard game versus one computer-controlled opponent is enjoyable. Unfortunately, the main gameplay modes feature multiple opponents versus a single player, and this can be trying for a number of reasons. Most importantly is the game's control. Star Wars Demolition, honestly, doesn't control too well. The ships are very floaty. I expect a ship to be floaty, being that it is floating, but these crafts are actually very hard to control. Just be sure to turn early, if you can. If not, you may end up in a wall. This can be quite a problem in close combat situations. Two crafts attempting to fire at each other end up just spinning around in circles firing at nothing. Also, the way these crafts handle and turn resembles automobiles more closely than it does floating spacecraft, even if the control isn't tight. Have you ever seen a snowspeeder sit stationary in one place while spinning around in circles? Probably not. These ships should behave like ships, not like an old Cadillac. The splitscreen deathmatch comes off pretty well. Unfortunately, the graphics that I have praised are not quite perfect. I look at this game from a certain point of view, which is this: it is a very good-looking Star Wars game. But that doesn't change the fact that the title suffers from some of the worst draw-in this side of G-Police. Most often there is a thick fog to cover the draw-in, which is not too far into the horizon. 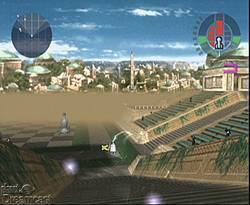 But on some stages, such as Naboo, the fog tends to disappear. This means that the 3D background elements draw right in from the background image. Not only is this very distracting, but also very annoying. This is probably a remnant from the Vigilante 8 engine that the game was built on top of, but it's almost inexcusable in a modern Dreamcast game. The most important thing about a video game, though, is that it provides some kind of enjoyment to the player. And that's one of the major flaws about this game. For me, it's just not fun. If we were to remove the Star Wars license and re-release the game, what you would have is the same vehicular combat game you played last year: Vigilante 8. So, I guess it's kind of positive that the license gives the game some value, but that's not enough to sustain it in the long run, I'm afraid. I've never been a fan of vehicular combat titles, and this game hasn't changed my mind. And though the license was enough to get me interested in the game, it wasn't enough to win me over. If Twisted Metal and Vigilante 8 are your bag, then you might want to sample Star Wars Demolition. You'll find the action and gameplay you're used to with a Star Wars twist, which might be enough to keep you busy until the next game. Myself, I'll be awaiting Star Wars Galaxies for my next Lucas-related gaming fix. Highs: Graphics mostly impressive, good music, smooth multiplayer battles. Lows: Weak Control, some graphical glitches, rehash of V8.